rubbing alcohol | Are We There Yet? When we bought our Microfiber couch two years ago I figured it was the first new couch I’d ever had as an adult. I was so excited by the purchase that I never stopped to think about my kids destroying it. So, here we are two years later and it was starting to look (and smell!) not so new. When I found this tip on Pinterest I HAD to try it. My results were not nearly as noticeable as the results from Pinterest but there’s a couple reasons for that . 1. 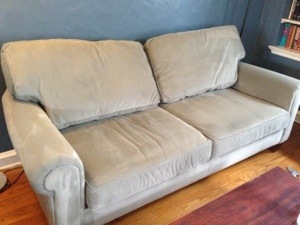 My couch is only two years old 2. It isn’t as light of a color 3. I don’t have pets (the Pinterest link photos involve dogs). Needless to say, I noticed a difference in the look of my couch and the smell! It really neutralized the odors. This one you could easily already own the needed materials. 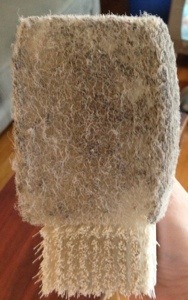 A vacuum, spray bottle, rubbing alcohol, a white sponge and a white scrub brush. Note: They should be white in order to insure that no color bleeding occurs. 1. 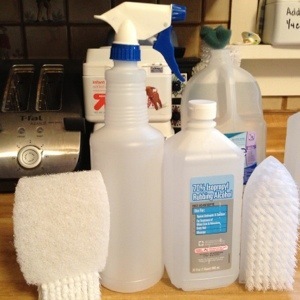 Fill the spray bottle with rubbing alcohol. 2. 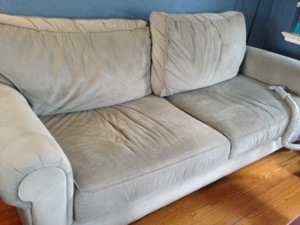 Vacuum the couch to rid it of all loose particles. 3. Work I’m sections spraying an area with the rubbing alcohol and then using the sponge to clean it. I worked in a circular motion and it worked well and actually rather quickly. 4. Let it dry and then if your material is stiff once dry use the scrub brush to loosen it up again. No, the sofa doesn’t smell like rubbing alcohol. It really neutralized the odors in the couch. It also got rid of a two month old formula stain.